Nha Sang is home to tempting a variety of Asian cuisine served in both traditional favorites and unique dishes. 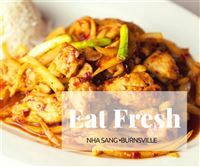 At Nha Sang, we raise the concept of "fresh" to a whole new level of dining experience. We prepare each meal for you, when you order!